Yesterday, the New Mexico Supreme Court’s newest member, Judith Nakamura, was sworn in as Chief Justice. She succeeds Justice Charles Daniels in that post. The swearing-in ceremony took place yesterday at the New Mexico Judicial Conclave here in Albuquerque. You can read the details in this story by Katy Barnitz in the Albuquerque Journal. 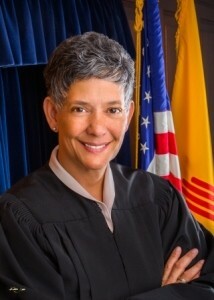 Chief Justice Nakamura was a longtime judge on Albuquerque’s Metropolitan Court until Governor Martinez appointed her to the Supreme Court in 2015. She is a hot-air balloon pilot, and a cancer survivor. Also, thanks and appreciation are in order for Charles Daniels’ work as chief justice. He has worked long and tirelessly to improve New Mexico’s judicial system. This entry was posted in New Mexico Supreme Court, News and tagged Chief Justice Judith Nakamura. Bookmark the permalink.